Jan van Eyck brings on a revolution in the history of painting in the Low Countries between circa 1420 and 1441. He is probably brought up by his older brother, Hubert, whose Ghent Altarpiece he completes in 1432, following Hubert's death in 1426. Jan van Eyck's work makes an abrupt end to the refined ‘international style' that dominates the art at the time. With his precise observation and naturalistic rendering of reality, his brilliant colouring and the oil technique that he perfectly masters, though did not invent, gives Van Eyck the look of a virtuosity that scarcely will ever be matched. As diplomat and court painter of the Burgundian dukes, he moves within the highest circles throughout his entire lifetime. Hubert van Eyck is probably born in Maaseik. After the death of Louis of Male, his son-in-law, the Burgundian duke Philip the Bold, rules over the Flemish counties. Jan van Eyck is probably born in Maaseik. ‘Meester Hubrecht' paints an altar tableau for one of the convents in Tongeren. Death of John the Fearless, the second duke of Burgundy. His son Philip the Good succeeds him and from that moment rules over Flanders. The Ghent patrician Joos Vijd gives Hubert van Eyck the assignment for what will be the Ghent Altarpiece (St. Baafs Cathedral, Ghent). Jan van Eyck works as a painter in the services of John of Bavaria-Straubing (1374-1425), who abdicates the principality of Liège and from 1417 on excercises control over the counties of Holland, Zeeland and Henegouwen. Jan van Eyck works together with many assistants in the princely residence in The Hague, the so-called Inner Court. Van Eyck is mentioned as court painter for the first time in documents of the Dutch Accounting office, but he probably already serves this function in previous years. After the death of John of Bavaria (6 January), Jan van Eyck departs for Bruges. In one document drawn up on 19 May, he is named as the court painter of the Burgundian duke, Philip the Good. Jan van Eyck leaves for Rijsel in the summer and around Christmas time receives his first annual stiped as ‘valet de chambre' (chamberlain) of the duke. Hubert van Eyck is paid for two design drawings on assignment of the Ghent Magistrate. On the occasion of a visit by the Ghent councilmen to Hubert van Eyck's work place, his assistants receive the customary gratuities. In August, Jan van Eyck is paid by the Burgundian Accounting office for two business trips on assignment for Philip the Good. The first trip is the pilgrimage that he makes in lieu of the duke. The second is stamped as a secret mission that the artist goes to ‘faraway lands' as stated in the document, that are not allowed to be called by name. It is suspected that the artist made a pilgrimage to the Holy Land via Italy and that the second trip took him to the various cities of the Ottoman empire. In October, Jan van Eyck again receives a stipend for a ‘secret and far trip' that he makes on assignment of the duke. The testament of the Ghent patrician Robert Poortier that was drawn up in March, mentions an altar tableau and an image of St. Anthony that was made in the work place of Hubert van Eyck at the time. In the late autumn, the Accounting office of Ghent notes the receipt of estate tax for the painter ‘Lubrecht van Heyke,' who died at the end of August. The assistants probably continue working from his work place under the supervision of Jan van Eyck on the Ghent Altarpiece. The Burgundian Accounting office in Lille pays Jan van Eyck various payments for his services at the court. These payments may be connected with the wall murals in the duke's residences, among which is the Hesdin castle. On the fest of St. Lucas, the court painter attends a banquet of the painters' guild of Tournai, where Robert Campin and Rogier van der Weyden are also present. The magistrate of Tournai distributes the ‘honour wine' for these reasons. 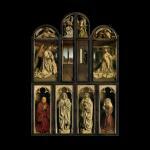 On 23 March, Jan van Eyck is back in Tournai. In the spring, the Accounting office of Lille pays a bonus to the painter in addition to his annual stipend. Moreover, his travel expenses in the summer of ‘certain secret trips' are also paid. During the summer, Jan van Eyck moves out of his house in Lille and at the end of the summer sets off via England and Spain with a Burgundian envoy of high rank for Portugal, where the approaching wedding of Philip the Good and the Portuguese Infante Isabella is being negotiated. Among the Burgundian diplomats is also Baudouin de Lannoy. Jan van Eyck paints two portraits of the princess in Portugal, which in February are sent to the duke over land and sea. While people are waiting for the answer, a few Burgundians, amongst whom is also Van Eyck, make a pilgrimage to Santiago de Compostela. They meet King John II of Castille, and Mohammed, the king of Granada. In September, the bride departs with her entourage by ship to the Low Countries, where she arrives on Christmas Day in Sluis, one of the Bruges outer harbours. Lambert van Eyck, a brother of Jan van Eyck, is paid for services to the duke. 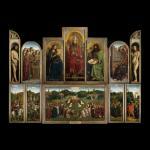 On 6 May, the Ghent Altarpiece in St. Jan's Church (now Sint-Baafs Cathedral) is presented. This same day, the baptismal ceremony of Joos van Gent takes place. Joos van Gent, the son of Philip the good and Isabella of Portugal, dies shortly thereafter. A short time later, Van Eyck must have settled permanently in Bruges and set up a studio there. From the summer until his death, he paid a mortgage payment to the St. Donaas church for his house in Bruges. In this time, the magistrate of Bruges visited the painter's studio and paid gratuities to his assistants. The duke and his entourage also paid a visit to the studio in Bruges. For more information concerning the restauration and study of the Ghent Altarpiece, visit this website. Each centimeter of the altarpiece was scrutinized and photographed at extremely high resolution in both regular and infrared light. Jan van Eyck paints the Portrait of a Man (Léal souvenir) (dated 10 October 1432) (National Gallery, London). 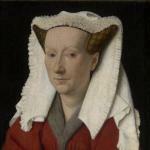 Lambert van Eyck paints the now-lost Portrait of Jacoba of Bavaria the same year. Van Eyck paints Portrait of a Man (self-portrait?) (dated 21 October 1433) (National Gallery, London), with the personal motto of the painter on the frame: ALC IXH XAN for the first time. Probable marriage of Jan van Eyck with ‘damoiselle Marguerite' (Margaretha van Eyck). On assignment of Giovanni di Nicolaio di Arnolfini, the artist paints The Arnolfini Portrait (National Gallery, London). The same year he receives the project for the Madonna with Canon Joris van der Paele (Groeninge Museum, Bruges) and probably for the Madonna with Chancellor Rolin (Paris, Musée du Louvre). The first child of Jan van Eyck is named after his godfather, duke Philippot of Philippotte and is baptised. The duke, who was represented at the baptism, gave six silver chalices crafted by the Bruges goldsmith Jan Peutin as a baptismal gift. From the autumn, Van Eyck works on assignment of the city magistrate on the gilding painting of six stone sculptures of the counts of Flanders for the façade of the Bruges Town Hall. The following year he is paid for this. The duke changes his annual stipend to a life-long annuity, and multiplies the sum many times over. He personally gives the Burgundian Accounting office the assignment to pay out the amount immediately to his cherished court painter. At the request of Philip the Good, Van Eyck travels to the Peace Congress in Atrecht (Arras) in order to portrait the participants. There, he makes the Portrait Drawing of Niccoló Albergati (Staatliche Kunstsammlungen, Kupferstich-Kabinett, Dresden). He probaby completes the Madonna with Chancellor Rolin. Completion of the Madonna with Canon Joris van der Paele (Groeninge Museum, Bruges) and The Portrait of Jan de Leeuw (Kunsthistorisches Museum, Vienna). On assignment of the duke of Burgundy, the artist takes up again a faraway trip to ‘foreign lands' in order to deal with ‘secret circumstances'. His stipend is supplemented with a double annuity. Completion of the Madonna and Child with Saints George and Catherine (Gemäldegalerie, Dresden), a travel altar on assignment from a merchant from Genova. 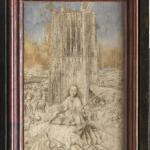 Jan van Eyck begins work on the Saint Barbara (Royal Museum of Fine Arts, Antwerp). The work also remains unfinished. Completion of The Portait of Niccoló Albergati (Kunsthistorisches Museum, Vienna). Van Eyck pays the book illustrator Jehan Creve for the painting of initials in a manuscript that is destined for the duke. The Accounting office of Lille pays him for the cost the following year. The initials are probably related to the so-called Turin-Milan book of hours, which Van Eyck and his studio had begun. 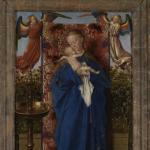 Completion of the Madonna at the Fountain (Royal Museum of Fine Arts Antwerp) and the Portrait of Margaretha van Eyck (dated 17 June 1439) (Groeninge Museum, Bruges), as well as the Portrait of Christ. The original is lost (dated 31 January 1439). The Groeninge Museum in Bruges is in the possession of a copy from the last quarter of the 16th Century. Jan van Eyck provides the duke ‘a few panels as well as other secret objects' for which he is remunerated the following year by the Accounting office. He begins on the uncompleted Madonna of Nicolas van Maelbeke (gone lost during the French Revolution). Jan van Eyck dies in July. His widow receives from the duke a one-time stipend worth her departed husband's annuity as financial support. Completion of the Virgin and Child, with Saints and Donor (The Frick Collection, New York). The Valencian merchant Gregori obtains Van Eyck's Saint George (the work is since lost) for Alfonso V of Aragón in Bruges. Cyriaco d'Ancona mentions Jan van Eyck as a famous painter. The daughter of the painter enters a cloister in Maaseik. The Van Eyck house in Bruges is sold, the studio is dismantled. Bartolomeo Facio mentions works by Jan van Eyck in Italian possession, amongst others The Lomellini Triptych (probably destroyed by a fire in 1504), which was then to be found in Naples, as well as a work with bathing women (the works has since been lost) in Urbino. Giorgio Vasari incorrectly ascribes the invention of oil painting to Jan van Eyck.